Boom Studios has a hit on their hands with Lumberjanes, drawn by Brooke A. Allen, a part of their Boom! Box line of comics. 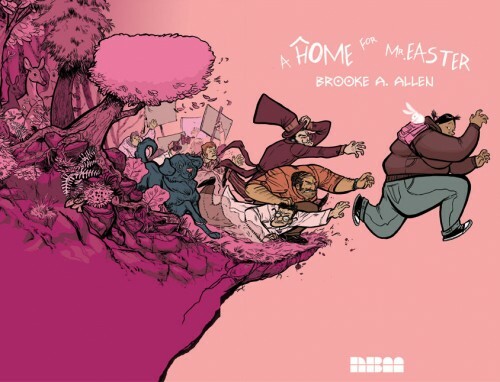 But this isn’t the first time the world’s seen Brooke: She has published with NBM before with 2010’s A Home for Mr. Easter. Tesana has never really fit into anything before but her daydreams. But when making an attempt to connect to her peers by joining in a pep rally planning committee she suddenly discovers a little white rabbit that lays brightly colored eggs. Realizing that she may have found the real life Easter bunny, Tesana embarks on an epic quest in an effort to get him back to his natural habitat and into safe hands. However as she progresses on her fanciful journey she gains more and more undesired attention until the quest becomes an increasingly madcap race to stay ahead of greedy pursuers and find a safe place for her new friend…wherever that place may be. It’s Tesana against the world! Be sure to catch what the Miami Herald called” moving, memorable and rollicking” with Comics Waiting Room reviewing Allen’s artwork as “bold, fantastical and beautiful in its purity.”A Home for Mr. Easter is in Previews Magazine right now, be sure place your order from your local comic book store’s Diamond catalog! For previews and ordering information, visit our website. For insight into Brook A. Allen’s artistic process, see her previous posts on our Author Blog..
On September 14-15th, you can find some of the most prestigious names in comics at the 2012 Small Press Expo (aka SPX). 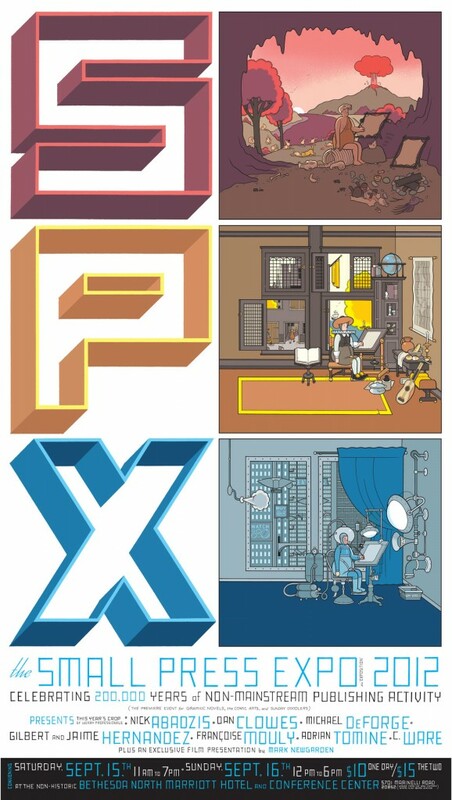 Unlike many conventions that are geared toward pop culture or corporately owned comics, SPX was created in 1994 to promote artists and publishers who produce independent comics. SPX hosts an annual festival that provides a forum for artists, writers and publishers of comic art in its various forms to present to the public comic art not normally accessible through normal commercial channels. It’s one of NBM’s favorite shows and this year we’re proud to bring three of our talented authors with us and the debut of our newest title. Margreet de Heer will bring her new book, Science: A Discovery in Comics and will be signing throughout the weekend. Science: dull or hard to understand? Not if you read this book! The creators of Philosophy – a Discovery in Comics take on a new challenge, and explain the different scientific disciplines in clear, colorful chapters. Margreet will be appearing at the NBM booth throughout the weekend and will be signing both Science, as well as her previous book, Philosophy. Also appearing are Dara Naraghi and Brent Bowman, creators of the recently released first volume of the trilogy, Persia Blues. Minoo Shirazi is a rebellious young Iranian woman, struggling to define herself amidst the strict social conventions of an oppressive regime, and the differing wishes of an overbearing father, in between life in Iran and life in midwestern America. Minoo Shirazi is also a free-spirited adventurer in a fantasy world, a place where aspects of modern America and ancient Persia meld into a unique landscape. And yet, neither of these women are the true Minoo Shirazi. At the intersection of guilt and freedom, family and self, ancient myths and modern enigmas, lies…Persia Blues. Also attending the show are Brooke A. Allen (A Home For Mr. Easter) at Table L8 and Jesse Lonergan (Joe and Azat, Flower and Fade and an upcoming title that he’ll have mini comic excerpts from) at Tables N9-10. We’ll also be offering all of our latest titles and prints from artists Rick Geary and Stan Mack are available for free for any $30 purchase, with a signed version free with a $50 purchase. Throughout SPX, NBM can be found at tables G1-2. Don’t Forget To Visit Us At SPX This Weekend! Stan Mack will bring his new book, Taxes, The Tea Party and Those Revolting Rebels: A History in Comics of the American Revolution and will be signing throughout the weekend. A cartoonist de-mythologizes the Founding Fathers and makes them more ‘like us'”says The New York Times. Uncannily relevant to today’’s world. Learn about the original revolt against taxes: the Boston Tea Party, and the original Occupy movement: the Rebels in revolt against the status quo. A whimsical and informative pictorial history featuring a chubby, insecure King George III, rebellious and misunderstood colonists, loudmouthed and insensitive aristocrats, and more. Updated from the original “Stan Mack’s Real Life American Revolution” published by Avon books in 1994 .
at the White Flint Auditorium alongside Nick Abadzis Dean Haspiel and Ben Towle. Isaac Cates will lead these four artists in a conversation about images of place in comics. Also joining the festivities is Brooke A. Allen, creator of A Home For Mr. Easter, which remains one of comics’ strongest debuts in the last few years. If you haven’t checked it out yet, be sure to pick up a copy at the show. And finally, we will be premiering Abelard, from artist Renaud Dillies and writer Régis Hautière! The charm of Renaud Dillies strikes again: after the mouse of Bubbles and Gondola, here is another dreamer, little chick Abelard. To lure pretty Epily, Abelard sees only one solution: to catch the moon for her! So off he goes to America, the country which invented flying machines. Armed with his banjo and his proverb-sharing hat, he launches out on the country roads, meets Gypsies, then Gaston, a grumpy bear with whom he will share a good bit of his way… As opposed to dreamer Abelard, Gaston has his feet firmly planted on the ground. With this funny animal road-movie where the absurd becomes poetry, Régis Hautière and Renaud Dillies offer us another small jewel. Can’t wait to see you at the show! Author Stefan BlitzPosted on September 13, 2012 Categories Author Appearances, EventsTags A Home for Mr.Easter, Abelard, Brooke A Allen, Régis Hautière, Renaud Dillies, Stan Mack, Taxes The Tea Party and those Revolting RebelsLeave a comment on Don’t Forget To Visit Us At SPX This Weekend! NBM Is Going To SPX and Bringing Stan Mack, Brooke Allen and ABELARD! Next weekend, you can find some of the most prestigious names in comics at the 2012 Small Press Expo (aka SPX). Author Stefan BlitzPosted on September 7, 2012 Categories Author Appearances, Blog, EventsTags A Home for Mr.Easter, Abelard, Brooke A Allen, Régis Hautière, Renaud Dillies, Stan Mack, Taxes The Tea Party and those Revolting RebelsLeave a comment on NBM Is Going To SPX and Bringing Stan Mack, Brooke Allen and ABELARD! Stan Mack premiering the new edition of his graphic album on the American Revolution. Fuzzy sorry, but Brooke Allen signing her Home for Mr. Easter and showing off all her fun little cast bunnies. Catch her at SPX, she'll have those with her. See her page and blog here. Cornnell Clarke of Eurotica's Peanut Butter series was signing there most of the time. At a dinner at the Royal India in the Gaslamp Quarter, from left: Jim Salicrup, ed.in chief at Papercutz, Cornnell, me, Brooke, Stan Goldberg, famous Archie artist and now artist on Papercutz' 3 Stooges and Nancy Drew and Jolyon Yates, artist on Ninjago. I couldn't help it!! Geary's wife Deborah (wearing some outrageous wig that night), Rick, me, Brooke. …and only in San Diego: an endless freight train lumbering past the Con. ctr. while thousands of fans wait to be able to leave the ctr at the end of the day!! This last weekend’s MoCCA was excellent and generally brisk for us thanks in good part to a great reception of Guest of Honor P. Craig Russell’s latest volume in his Fairy Tales of Oscar Wilde, The Happy Prince, we premiered there. Many fans had come to the show with stacks of accumulated comics of his, going back all the way to even his earliest for him to sign, besides the new book. Craig had done a gorgeously roccoco/art nouveau-ish poster for the show. That art ended up making beautiful T-Shirts and postcards as well! In all, we sold out of most of the books we brought and this time Sunday, normally a much slower day, came close to the level of sales we had on Saturday. I have to say, the show started also much more slowly on Saturday than usual but the crowds accumulated and throughout it was good and steady. This Weekend, NBM Proudly Debuts P. Craig Russell’s The Fairy Tales of Oscar Wilde V. 5 at MoCCA! 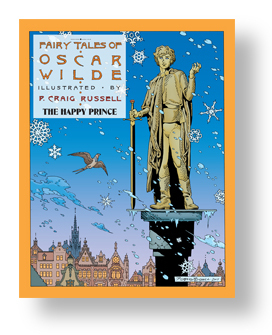 This weekend, at the 2012 MoCCA Fest, we’re debuting the long awaited fifth volume in P. Craig Russell’s The Fairy Tales of Oscar Wilde series, Volume 5: The Happy Prince. Craig will also be making a rare convention appearance and serve as the Fest’s very first Guest of Honor. In addition to the stunning volume, we’ll also have 10 copies of the signed and numbered edition of the book which are quarterbound in real cloth and fine paper with a tip-in sheet signed by P. Craig Russell. If that’s not awesome enough, Brooke A. Allen (A Home For Mr. Easter) and Neil Kleid (Brownsville, The Big Kahn) will also be hanging around the booth with publisher Terry Nantier and Papercutz artist Rick Parker (Slices, Tales From The Crypt). So, come by Booth J4, say “hello” and be one of the very first to own Craig’s newest book. Author Stefan BlitzPosted on April 27, 2012 Categories Author Appearances, Events, New ReleasesTags Brooke A Allen, Fairy Tales of Oscar Wilde, MoCCA, Neil Kleid, P. Craig Russell, The Happy PrinceLeave a comment on This Weekend, NBM Proudly Debuts P. Craig Russell’s The Fairy Tales of Oscar Wilde V. 5 at MoCCA!